The Lochaber Fisheries Trust was founded in 1996 to monitor and protect populations of native wild fish in the region. The Trust is a company limited by guarantee with charitable status, and is governed by a board of voluntary directors. Diane has been at the Trust since April 2008, though you may remember her from a brief spell as assistant biologist here a few years ago. She holds a PhD from the University of Glasgow where she researched maturation and growth rates in salmon parr across the country. Much of her PhD fieldwork was done in collaboration with Fisheries Trust biologists and the Fisheries Research Service, giving her an insight into fisheries management and research structures in Scotland. She has also worked for Scottish Natural Heritage in Sutherland. However she was very happy to return to the Trust and the delights of fieldwork in a Scottish summer! Diane is an experienced fish surveyor and a qualified electrofishing team leader. She co-ordinates the Trust’s research and monitoring work as well donning her waders and getting out into the field to catch fish. 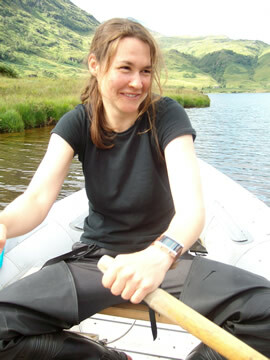 Lucy joined the Lochaber Fisheries Trust in September 2007. Previously she worked as an aerial surveyor for the Wildfowl and Wetlands Trust looking at the effect of offshore wind farms on the environment. Lucy studied marine biology at university, and was keen to return to work in fisheries. Lucy has recently taken up fly-fishing, with much very gratefully received help from local fisherman. Viv has been fishing since childhood, and has a keen interest in fisheries. He is Superintendent of the Morar catchment. He has a very wide range of experience in fisheries management, including running a hatchery and stocking programme, supervising smolt trapping and fish counter projects, electrofishing and habitat surveys and fisheries protection. Viv has been at Morar for 18 years, and knows the area intimately. His practical skills and leadership are much valued at the Trust. Grace has fished since she was a little girl when she would accompany her father fishing West Highland lochs, including Loch Morar. Grace has been involved with Lochaber Fisheries Trust for the past 12 years, taking over the mantle of a trustee from her late husband Bill W.S Henderson. Together with Viv de Fresnes they were involved in the first attempt at fish rearing for the Morar, setting up a tank in the garage at Morar Lodge. Sandy is a retired farmer from Perthshire and became a director of the Trust in 2004. He caught his first sea trout aged 6, in 1946 and is very aware of how the environment has changed since then. Animals, birds and fish have all been affected but especially wild migratory species. No one person or country can protect them throughout their lifecycle, so it is important to have organisations like the Trust working at a local level whilst feeding into national and international policy. As a keen fisherman he is happy to support the Trust in its work on native freshwater fish species. Barbara’s background is in accountancy and management. 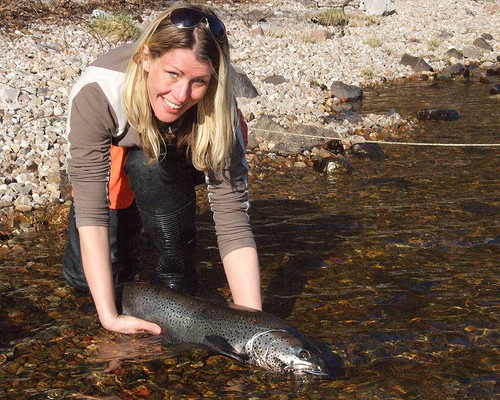 She has brought these valuable skills to both the Lochaber Fisheries Trust and to the Lochaber District Salmon Fishery Board, which she helped to found. Barbara is a keen fisher lady and has fished many rivers in Scotland and abroad, Morar being one of her favourite haunts. Donnie is a retired local Hotelier. In his earlier years he was game keeper at Lochailort and fished the river Ailort for over 50 years. In retirement he is highly involved in the Lochaber Trout fishing clubs. He is the chairman of the Kilmallie Angling club and runs all their competitions. Donnie fishes extensively all over Scotland and gathers information and ideas on fish and the freshwater environment from a broad range of fishermen. Simon has been fishing since the age of five and has been employed as a deerstalker, gamekeeper and river manager for 23 years. He has experience in riparian restoration work, river bank maintenance, predator control, stocking, poacher prevention measures and managing fishing tenants. He currently works on an estate with salmon, sea trout and brown trout fishing. Iain is a passionate fly-fisher and fly-tyer who has fished extensively across the Highlands & Islands of Scotland. His main passion is fishing for sea trout, though he has caught plenty of trout and salmon too! Following his passion for fishing, Iain gained qualifications in Fishery Management from the IFM. He is keen to see all stakeholders working together to oversee the recovery of wild migratory fish in our rivers.